Divar Island has been a well-kept secret for years and is thankfully still hidden away. Lying smack in the middle of the Mandovi River, it is just a five-minute ferry ride from the mainland. Probably smaller than the size of one of Mumbai’s most popular neighbourhoods, Dadar, this cute island is all about lush green paddy fields, lovely old Goan homes, local bars, fishing and the famous Bonderam festival. A ferry from Ribander jetty near Panjim or Old Goa will take you to this island. The main church called Our Lady of Compassion built in the 16th century is perched on the hill and is where you should head to first, as it offers a fantastic great view. You can see the river splitting into two and flowing whilst hugging the island along its banks before it meets up again. The Chorao Island can be seen in the distance, as well as the spires of the churches in Old Goa. Not to mention that with most villagers still doing a lot of farming, there is greenery everywhere to be seen. Ask anyone or just drive around and you will glance upon a step-well, which is not on any map yet, but definitely a treat to be discovered. Not to mention, getting lost on this island is pretty difficult but yet loads of fun. There are plenty of local eateries spread across which offer tasty home cooked food at really reasonable rates. Do pop into the local bakery in the main village of Piedade and try out their yummy puffs. Or parcel some food and go sit on the riverbanks and enjoy that meal with some cold beers. If it gets too hot, then take a refreshing dip in the cool waters of the Mandovi, however, we’d recommend you avoid that during the monsoon. The few villages on the island have gorgeous old, quaint Goan homes, which by themselves are a sight to behold. Drive around some more, and you will glance upon a few smaller churches or chapels, temples and a railway bridge that cuts across the island, though Divar has no railway station. All in all, Divar is almost lost in time and that is exactly why we love it. 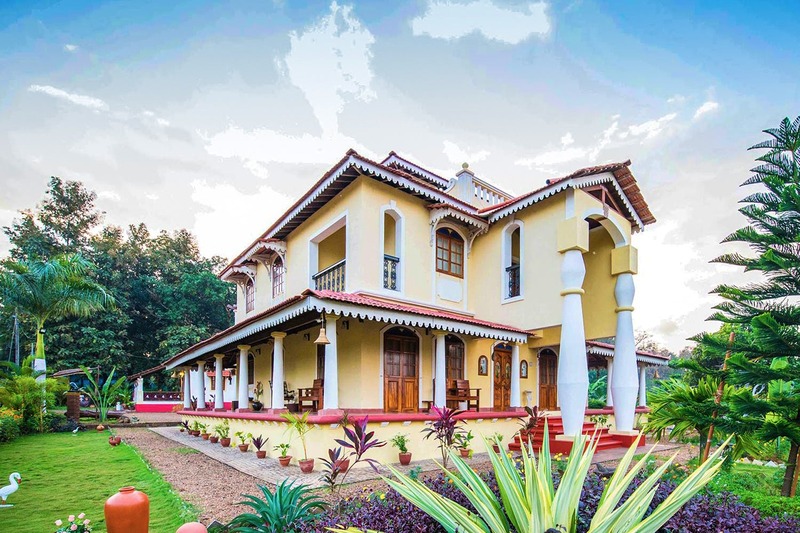 If you want to stay in Divar overnight or longer, there are beautiful homestays or villas that by themselves are heritage properties. They all offer comfortable rooms, good food and lovely hosts across various budgets. Of course, the best time to stay there is during their annual weekend Bonderam festival that happens in August, so as to enjoy the festivities. Check out the Island House, Moradia Dos Quadros, Wow Villa or Casa Dos Silveira for that idyllic island holiday. Rates start from INR 2,000 for a room per night, going up to INR 14,000 to book a full villa for a night. It is advisable to rent a car, bike or bicycle which can all be taken across on the ferry. At Ribander, there are two separate jetty points, one for Chorao and one for Divar, so make sure you ask before you get on the ferry.